Meet Histories Most Famous Pilots In Aviation Up Close and Personal. This page is not just dedicated to the Famous Aviators of the United States. It is dedicated to all the great aviators from every country, both military and civilian. For their outstanding accomplishments in the pursuit of aviation. There are Famous Pilots from all over the world who paid the ultimate price with their lives, for the advancements of aviation. And we honor everyone of them for their contributions to God and country. Without their outstanding bravery and courage, where would aviation and all of us be today? Right now let’s meet some of the greatest Pilots in Aviation History. 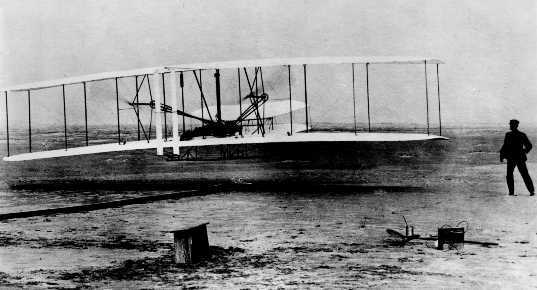 Wilbur and Orville became the first,"Famous Pilots" in Aviation History On Dec 17,1903 at Kitty Hawk, NC the Wright Brothers became the first two men to ever fly A Power Driven, heavier-than-air-machine. On the first flight Orville was at the controls and flew the plane 120 feet and was in the air 12 seconds. A total of three flights were made that day the longest flight was made by Wilbur going 852 feet that lasted over 59 seconds. They were both famous that day, and apart of aviation history forever. All these flights were observed by four other men and a boy as witnesses to the first flight. The photographer was so shocked when the contraption took off and flew he thought he had missed taking the picture. To his amazement he somehow managed to snap the camera at the last second getting the above picture. After the Wrights Brothers initial success at Kitty Hawk these two now famous pilots achievements went basically unnoticed. Because people remained very skeptical about flying at the time. So for the next five years they quietly worked on perfecting there plane and developing new flight techniques. Wilbur Wright was born April 16,1867 on a farm 8 miles from New Castle,IN and Orville Wright was born Aug 19,1871 in Dayton Ohio. Their Father was a Bishop of the United Brethren church. Both boys from a very early age were fascinated with mechanical workings, and excelled in this area. Both boys completed the 12th grade in High School, but neither one received their High School diplomas though, not that it mattered. From a very young age the brothers were both fascinated with the idea of flying. Before there full time interest in flying, they had several things going. Orville built and operated his own printing press and the boys had their own newspaper, called "The West Side News". They also had rented and sold bicycles then later began manufacturing them on the floor above their workshop. The two brothers were always dabbling in something, they just couldn't help themselves! I'm sure neither boy ever imagined that one day soon they would both be very famous pilots! Lindbergh slowly climbed the plane to avoid a stall and headed out to either make history, or to never be heard from again. 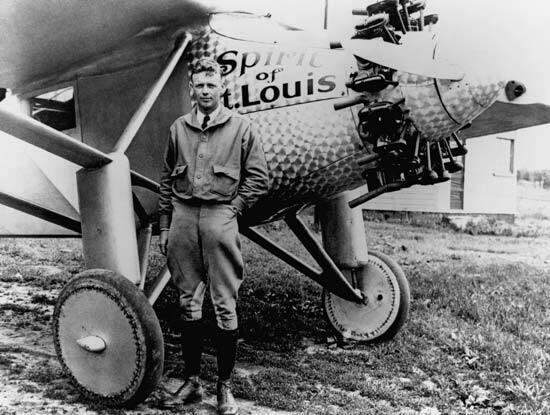 As Lindbergh was making his way across the Atlantic he had many challenges to deal with, anyone of which could have led to disaster if not for his calm composure. He was able to calmly handle each problem as they occurred. This was a great trait that helped Lindbergh become the famous pilot he was. Quick calm thinking, saved his life on more than one occasion. After 33.5 hours in the air Charles Lindbergh finally landed at Le Bourget Field in Paris on a Saturday night at 10:30 p.m. on May 21st 1927 this now famous pilot was greeted with a hero's welcome by all of Europe. And once home he was awarded with the "Congressional Medal of Honor" and given a Hero’s Welcome from a Grateful Nation. After the ticker tape parade in New York City, the famous pilot flew the Spirit of St Louis around the country into every state and was cheered as a hero by all the people. The Ryan Airline Factory built the Spirit of St Louis per Lindbergh's specifications and would carry 451 gallons of fuel weighing in at an additional 4,027lbs. The total weight of the plane would now be over 5200 lbs., Charles had never before taken off with this much weight before. Even though the design Engineers didn't want the fuel tank located behind the engine, Lindbergh insisted on it. He did not want to be sandwiched between the engine and the fuel in case there might be a crash. He had seen what happened to other fliers who crashed with the tank behind them and burned before they could get out. Charles didn't want any part of that happening to him. Another advantage of the fuel tank being in the front, was he could more easily manage and control all the various fuel valves while flying. Charles Lindbergh was one very courageous pilot to accomplish flying across the Atlantic. Can you imagine how scary that must have been, in a single engine plane. If that engine had any kind of problem, he would never have made it. If he had been off the slightest bit in his navigation, or fallen asleep he would never have been heard from again. Really makes you stop and think how lucky he was as well, doesn't it? Out of 117 Licensed Woman Pilots in the United States, 99 joined to further the advancement of woman pilots. This was a tremendous boost for all the women pilots of the day. And no doubt lead to all the great accomplishments of women famous pilots around the world, for Decades to come. On May 21st, 1932 she finally realized her dream of becoming the first female pilot to cross the Atlantic in a single engine plane. Just five years after Charles Lindbergh crossed the Atlantic in his Ryan built Plane it. She took off from New Foundland, Canada in a Lockheed Vega single engine plane and landed on the coast of Ireland just 15 hours and 8 minutes later. This was one of many things that made Amelia Earhart the famous pilot she was. But the trip was no picnic, she had flames shooting out of her engine exhaust, a fuel leak, and an altimeter that quit working along the way plus bad weather to deal with. Amelia went on to set many other records in both, speed and endurance before her aviation career was cut tragically short with what happen next. For a woman like Amelia to accomplish all these things she had to be both brave and courageous. Amelia Earhart & Navigator Fred Noonan disappeared on their Around the World Flight over the Pacific on July 2,1937. After leaving Papua New Guinea in route to Howland Island she transmitted a couple of times then was never heard from again. As a famous pilot she left quite a legacy in her wake. With many records and advancements for women fliers of the day. She will never be forgotten for her great work and flying achievements. She certainly proved that female pilots also had the right stuff, and could do anything men could do. Amelia Earhart became one of the greatest female pilots in the history of aviation. Eddie Rickenbacker the Famous Ace of World War I, Who was also a Congressional Medal of Honor recipient Eddie was born in Columbus, Ohio on October 8, 1890. At a very young age his father encouraged him by saying mechanical things have to have a purpose, find out what it is Eddie. Well that statement lead Eddie to many great opportunities throughout his life. One of his first jobs was with the Columbus Buggy Company where he eventually became a salesman. Shortly after that he became interested in automobiles and then got involved with racing and before long was racing in the Indianapolis 500. He raced there four different times, earning the nick name "Fast Freddie". Over the next few years he raced for different teams until he eventually joined the US Army in 1917 and entered France on June 26th, 1917 with the first American troops as a Sergeant First Class. What he really wanted to do was fly, but do to his lack of education he was not picked, but eventually he did indeed work his way into The 94th Aero Squadron. A month later he was awarded the French Croix De Guerre for 5 Kills which made him an Ace. By the end of the war Eddie Rickenbacker had 26 kills to his credit, and many more awards including the United States Medal of Honor. While Eddie was over there he flew over 300 hundred combat hours, more than anyone else in the war. When the Armistice was signed on November 11th, 1918. Eddie flew over the front lines to witness the troops cross and embrace one another in happy celebration. After the war Eddie started a company called Rickenbacker Motor Company in 1920's which offered the first 4 wheel brake system on cars. But after only seven years went bankrupt in 1927 owing over $250,000. Even though Eddie did not have to pay the money back, he did out of his own account nearly bankrupting him. It's just the kind of man he was. Shortly after that Eddie went on to purchase the Indianapolis Motor Speedway in 1927. Which he owned and operated with great success for 14 years. When World War II broke out he closed the race track to save fuel for the war effort. And after the war sold the Speedway to a businessman named Anton Hulman, Jr.
Next Eddie Rickenbacker purchased Eastern Airlines from GM in 1938 for 3.5 million. And it was destined for great success all through the war years and especially the post war years. In 1959 Eastern Airlines CEO Eddie Rickenbacker was forced out due to declining company profits. Four years later in 1963 at the age of 73 he resigned as the Board of Directors. During Eddie's life he survived two separate incidents where the Media confirmed he was dead. One occurred while he was flying on one of his Eastern Airliners On February 26, 1941. Eddie was a passenger on a Douglass DC-3 Airliner that crashed just outside Atlanta Georgia. And the other happened while flying on a B-17, carrying a secret message to General MacArthur. He left Hawaii on a B-17D in October of 1942 with a full crew aboard. Due to a problem with the Navigation Equipment the plane strayed off course hundreds of miles and ditched in a remote part of the Pacific never connecting with Canton island for refueling. For the next 24 days they drifted thousands of miles through Japanese waters and were eventually rescued by a Navy patrol plane. On July 23, 1973 Eddie Rickenbacker died of Pneumonia after suffering a stroke. He was truly a great aviator & patriot, who will always be remembered for his achievements in both flying and Business. She grew up among quiet and tasteful villas near Pasadena California and was influenced most by her Father and Grandfather from a very young age. Her Father taught her how to Hunt, Fish and Horseback ride along with many other outdoor activities. Her Grandfather was probably most responsible for her love and passion of Aviation though. One day he took her to an airshow and she vowed she would be a pilot one day. He was a Professor and flew Balloons during the civil War observing Confederate troop movements from the air for the Union Army. At the young age of 18, Florence Lowe Barnes and Rev C. Barnes were married and a short time later had a son named William Barnes. One year later Florence disguised herself like a man, then joined the crew of a tramp freighter heading for Mexico and ran off seeking adventure. Once arriving in Mexico she and another crewman jumped ship and began their four month exploration of revolution-torn Mexico in earnest. While in Mexico riding a Donkey her fellow explorer gave her the nickname "Pancho" because she reminded him of Don Quixote's Faithful companion. Florence liked the nickname so much, from that day on she was to be Pancho Barnes! After returning home from her Mexican adventure, she bought an OX- Powered Travel air Biplane and decided to take flying lessons. In just six short hours of training she was ready to solo. In celebration of the occasion she took a passenger up and buzzed the field while her friend wing walked through the piano wires. From that point on there was no stopping her from her dreams and flying passion. After getting board buzzing her husband’s Church on Sunday mornings, she decided to start her own solo flying show called, "Mystery Circus of The Air" and hired a very handsome man named slim who who would jump from the plane. Picture From www.panchobarnes.com Trust Estate Archives. 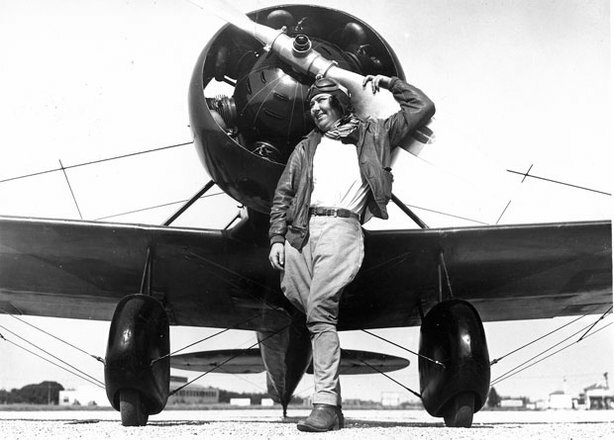 After a year of that this now famous pilot joined 19 other woman in an Air Derby from Santa Monica, California to Cleveland, Ohio but was unable to finish because while landing in Pecos, Texas Pancho ran into into a truck that decided to cross the runway at the wrong time. Back in the old days of aviation they didn't quite regulate things like they were suppose to. At any rate this ended her flying for the rest of the year. During the time down Union Oil Company hired her as a pilot for a three year time period performing demonstration flights and to promote work in exchange for sponsoring her in many air races over the years. 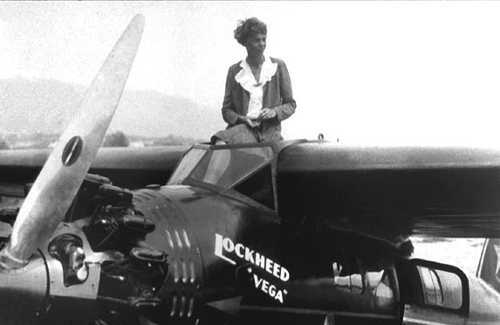 The following year she bought a brand new low wing Mystery ship and entered the Woman’s Powder Puff Derby beating out Amelia Earhart with a speed of 196.19 mph. Her next venture was to become a Hollywood Stunt Pilot and change the industry forever. After a very short time being a Technical Director for a film, she formed her own company and hired 3 pilots who flew in Howard Hughes movie, Hells Angels. When Howard wanted to hire them back, but this famous pilot would have none of that, until Howard Hughes signed her new contract. She then formed the first of its kind Union for the studio and pilots called; The Motion Pictures and Pilots Association. This provided both more steady work and hire wages for Pilots and studio workers. Poncho was a famous pilot now and knew many stars like Errol Flynn, Gary Cooper, Tyrone Power, and Ramon Navarro who she was rumored to have had an affair with. In 1935 Pancho took what little money she had left after the depression and bought an 85 acre ranch in the Mojave Desert near a Army Air Corps Air Base which later became Edwards Air force Base. Of course she built her own runway and bought her own plane which she flew often. Many famous aviators flew in frequently to visit her. Soon she had a 385 acre Dude Ranch called the "The Happy Bottom Riding Club". Over the years all the World War Two pilots and Later Air force Test Pilots hung out eating and partying at Pancho's Ranch. She helped the war effort by entertaining the men with her incredible flying tales along with plenty of R&R for the pilots. During the years there, she came to know many famous pilots like Chuck Yeager, Jimmy Doolittle, General H.H. Hap "Arnold", and many others. Later after the war Edwards Air force Base Brought Legal Condemnation Proceedings against Pancho and a short time later the ranch mysteriously burned to the ground. Pancho lost all her lifelong collection of pictures, Trophies, and Memorabilia and never fully recovered from that tragic night. Even though she swore one day she would, it just was not to be and this once famous pilot passed away years later by herself, forgotten in history after two cancer operations in 1975. Pancho was a fighter to the very end, and remains one of aviation's most loved and famous pilots to ever live and don't let anyone say different! Jacqueline Cochran was a true aviation pioneer and very accomplished famous pilot as well of the 20th century. She was considered to be one of the most gifted racing pilots in her generation. She won the Bendix Race, she set the woman's national speed record and altitude record in 1936. She was also the first woman to Ferrie a Lockheed Hudson V Bomber across the Atlantic to Britain. As part of a program called the "Wings For Britain". These were woman who ferried American Aircraft from The US to Britain. This now Famous pilot Jacqueline Cochran was instrumental in the planning and eventual creation of the (WASP) Woman's Air Force Service Pilots program. She won five Harmon Trophies as the outstanding woman pilot in the world, she was often called the "Speed Queen". She became the first woman pilot to break the sound barrier and the first female pilot to fly Mach 2. She also became the first woman to land and takeoff of a carrier. Jackie also became the first woman to fly by instruments alone. While Jackie was in Britain she volunteered to work with the RAF and the British (ATP) Air Transport Auxiliary. Soon she was back in the United States recruiting the most qualified woman pilots she could find. Then brought 25 of them back to England where they joined the Air Transport Auxiliary. While Cochran was working in England, she realized that the woman pilots back home could do much more than just ferrying planes around. In September of 1942 General Arnold created the (WAFS) Woman's Auxiliary Ferrying Squadron. They were to be based at Castle Air Base in Wilmington, Delaware. At the time Cochran was still in England working, and upon hearing about this new unit quickly headed right home. Once home she began lobbying General Arnold to create a unit of Female Aviators that could do much more than just ferry planes around. So in early 1943 the (WFTD) Women's Flying Training Detachment was formed as well. Later in the Fall of 1943 the two units of Woman's Auxiliary Ferrying Squadron and the Woman's Flying Training Detachment were merged together under one name called (WASP) Woman's Air Force Service Pilots with Jackie Cochran named as the director. While the Director of the WASP while she was stationed at Avenger School down in Sweet Water, Texas. While Cochran was there she trained hundreds of female pilots. Nancy Love would remain in command of the Woman's Ferrying Division. Picture From The National Archives. For her war efforts Cochran received two medals, one of them was the Distinguished Service Medal and the The Distinguished Flying Cross. Jackie Cochran also was the first female pilot to fly a jet across the ocean as well. The day this now famous pilot passed away, she still held more speed and endurance records than any female or male pilot in the world at that time truly making her one very Famous Pilot for all times. 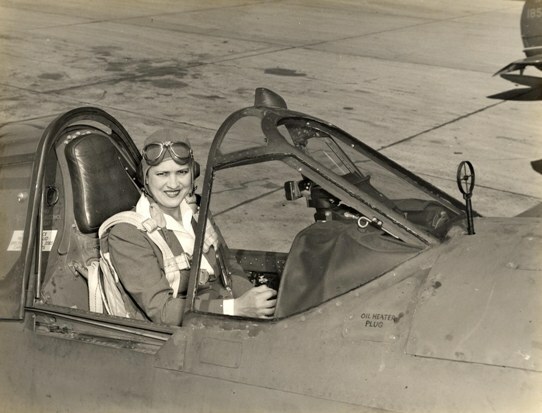 The now famous pilot Jacqueline Cochran was instrumental in the planning and eventual creation of the (WASP) Woman's Air Force Service Pilots program. She won five Harmon Trophies as the outstanding woman pilot in the world, she was often called the "Speed Queen". She became the first female pilot to break the sound barrier and the first female pilot to fly Mach 2. She also became the first woman to land and takeoff of a carrier. In 1949 France Awarded Cochran the Legion of Honor for her duty and service during the war and her accomplishments in aviation. She was also awarded the French Air Medal in 1951. Jackie was the only woman to ever receive The Gold Medal from Federation Aeronautique Internationale. First woman to be honored with her own display of personal achievements in the United States Air Force Academy. See list of more awards below. •Jacqueline was invested in the International Aerospace Hall of Fame in 1965. •Induction into the National Aviation Hall of Fame in 1971. •The International Astronomical union assigned the name Cochran to a 100km in diameter Crater on the planet of Venus. •Induction into the Motorsports Hall of Fame. •The United States Post Office honored Cochran with her own stamp . •Cochran is one of the Inductees into Lancaster , California Aerospace walk of honor, and the first woman to be inducted. •Jackie was designated a Woman’s History Month Honoree by the National Woman’s History Project. She was born on May 11,1906 Bessie Pittman near Mobile, Alabama and was the youngest of five children. She spent most of her young years in poverty while living in a small town of Florida. But like most kids, she survived and went on to live a very full and exciting life. Jacqueline became both a very famous pilot and successful Business Woman with Cosmetic Company called Wings. She died in August of 1980 in Indio, California at the age of 74. At the time of her death many of her flying records were still in place. Thanks so much for flying in and checking out our new Famous Pilots Pages 1-2. As always, stay safe and "Happy Flying".